The results of the 2016 Annual Print Compeition have been announced. All of the images are on display at Lloyd D. George United States Courthouse 333 S. Las Vegas Blvd. Las Vegas, Nevada February 16, 2016 through April 13, 2016. Color Rick Holmes Say Ahhh! 1st / BOC / BOS Rick Holmes Say Ahhh! With a comprehensive knowledge of modern and contemporary art, Jerry Olivarez has devoted his career to the furtherance of the arts in universal range and to the controversial understanding of art criticism. As a fine art consultant with the Jeff Mitchum Gallery at the Bellagio, his specific focus has been a push towards advocacy and guardianship, by representing over 300 artists. Jerry and his wife, Nicola, have contributed to this deeply held belief, by supporting the arts themselves, acquiring of over 100 works of art. Max Remington is an internationally collected Fine Art and portrait photographer who, through the years, has enjoyed working in many areas of photography, but has specialized in landscapes and the mastery of natural light. He is known for the detail of his images, his complex and often abstract symmetrical composition, and wearing well tailored suits. His work may be viewed at http://www.maxwellremington.com. David Shin, owner of Pro Image Photo Lab and iphotoshop.com, is dedicated to providing high quality prints at affordable costs to his consumers. Experienced in the profession himself, David interacts directly with clients on the principle of providing the best possible customer service in order to bring photographic art to life. His knowledge and expertise are offered to professional and amateur shooters nationwide to ensure full satisfaction is met. With over 28 years of experience in the industry, David continues to lead his team of imaging professionals in all things print and photography. David enjoys shooting landscape photography using large and medium format film cameras. Thank you to the sponsors of our Annual Banquet Raffle. If you want your image featured on our social media accounts please Submit it Here. 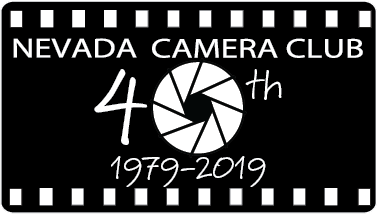 2019 © Nevada Camera Club All Rights Reserved.